Staying with the commitment of developing products that are eco-friendly, Azafran Innovacion Limited - an integrated personal care company has launched its home care vertical Azafran Home – Green & Clean. 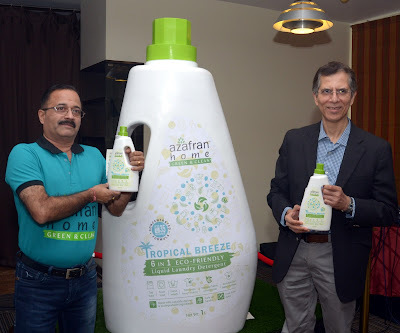 Company forayed into this segment by launching India’s 1st plant based (coconut based detergent) liquid laundry detergent and is planning to come up with more products such as hand washes, home fragrances and organic candles soon. Set up with a concept of ‘Farm to Home’, Azafran Home – Green & clean products are made using sustainable and natural ingredients which are safe for people as well as the planet. Company is in talks with Aditya Birla Retail – More Hyper Markets, Reliance Smart Stores, Spar, Hypercity and Metro Cash & Carry among other modern retail outlets for this division. Made from naturally derived & plant based ingredients which are free from dyes, Tropical Breeze - 6 in 1 Eco friendly liquid laundry detergent caters to all laundry needs and ideal for machine as well as hand wash. Developed from certified organic ingredients, grown in its own farmland near Sanand, Ahmedabad, company’s innovative range of products are devoid of harmful chemicals, pesticides and fertilizers. Tropical Breeze removes tough stains, eliminates unpleasant odours and works as a natural fabric conditioner. This eco- friendly detergent is also suitable for baby cloths. Commenting on the trends, Elkana Ezekiel, Non-Executive Director, Azafran Innovacion Ltd said, “Our products are made without any compromise on quality and fulfilling our commitment to the environment. Company seeks to provide simpler & more sufficient way of living - a higher quality of life, toxin-free homes and more time spent in nature. Organic living is an established trend in developed countries and the concept is fast catching up in India with consumers opting for organic products for daily life. Our strength lies in the ‘Farm to Home’ concept where the entire process of growing ingredients, processing and making the products, all are done at our own facilities. Azafran has its own organic farms with large greenhouses where numerous varieties of plants, flowers and herbs are grown specifically for its product range. Ingredients for the products are extracted and processed at its facilities to ensure maximum purity. Azafran has been awarded the USDA, ECOCERT stamp of approval. The company has done extensive investments in R&D and a production facility certified by ISO 9001, ISO 14001, OSHAS 18001, WHO and GMP. Azafran Innovacion Limited is a research oriented company based out of Ahmedabad, which offers innovative organic solutions for the Indian market. Azafran products are all made from certified organic ingredients, and are devoid of harmful chemicals, pesticides and fertilizers. Azafran’s product lines are created using nature's purest ingredients that are grown, harvested, extracted and processed at our own facilities. Azafran has invested about Rs 20 crore to set up its completely integrated 40 hectare facility near Sanand, Ahmedabad which includes its own ECOCERT and USDA approved organic farm, large greenhouses, manufacturing facility and dedicated R&D centre for cosmetic research. Azafran grows numerous varieties of plants, flowers and herbs for its product range. Company extracts and processes these plants in its own facility and ensures 100% natural purity. Azafran is the brainchild of two promoters, Aditi Vyas and Mansi Vyas who hold an incredible passion for innovating products made with certified organic ingredients. Azafran is one of the first companies in India to receive international certifications like ECOCERT France and USDA certification for organic farm. Company’s production facility is certified by ISO 9001, ISO 14001, OHSAS 18001, WHO and GMP. Company’s products are also certified by India Organic and Halal.